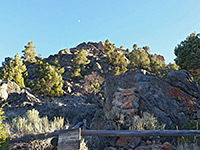 In the eastern foothills of the Egan Range near Ely, Ward Charcoal Ovens State Historic Park is a small preserve containing a row of six well preserved stone ovens dating from 1876, set in a typically remote Great Basin landscape of gently-sloping, sagebrush-covered hillsides and small summits. The site is reached only by unpaved roads, and much of the surroundings are completely undeveloped, though the park itself has several facilities including a campground, picnic tables, ranger station and a network of short trails. Other features within the 2 by 1 mile area are rocky outcrops, several springs and two streams, the north and south forks of Willow Creek, which flows just a few miles before dispersing in the vast flats of Steptoe Valley to the east. The park has elevations in the range of 6,900 to 7,900 feet, so is cold and snowy in winter, hot and dry in summer. Charcoal was produced in many locations across the West in the nineteenth century, used by smelters and blacksmiths, and it was usually made by slow burning of wood in beehive-shaped ovens. 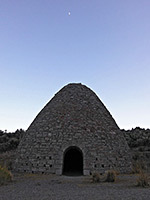 Only a few such structures remain today; other preserved examples include Piedmont Charcoal Kilns in Wyoming, Basalt Historic Charcoal Kilns in Aspen, Colorado and the Wildrose Charcoal Kilns in Death Valley National Park, California. 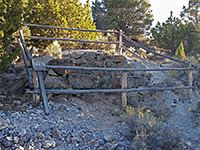 The Ward Ovens were established to supply silver mining operations two miles north, and were active for just three years, until 1879, when the claim was exhausted. The wood burnt was juniper and pinyon pine, both quite plentiful on the nearby mountain slopes. The ovens were later used as temporary shelters, and remained on private ranch land until 1956, when they were transferred to state ownership. Each oven is 27 feet across at the base and 30 feet high, made of the local light-colored bedrock, a type of tuff. The state park is reached by two good quality gravel roads forking off US 6/93, south of Ely - the 11 mile Cave Valley Road or the 7 mile CR 16 - both traverse flat, treeless terrain, beside or across Steptoe Valley. One short side track leads to the camp and ranger station, while another reaches the ovens. The elevation is just a little higher than the valley floor, enough for sagebrush and pinyon/juniper pines to grow. 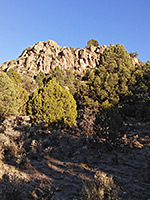 The ovens are right beside the access road, and are viewable from above via the 0.9 mile (loop) Overlook Trail that climbs around a cliff-lined hill (Rocky Point Spur) to the south. The path also passes two small, ruined lime kilns, used to produce mortar for construction of the ovens. Other trails include the 2 mile Riparian Loop along the two branches of the stream, the 1.6 mile Ridgeline Loop that crosses a small ridge between the two forks, and the 2.2 mile Ward Legacy Trail that follows the western and northern perimeter of the park. The campground accommodates tents and RVs (no hookups). Other activities are fishing (for trout) along Willow Creek, cycling on the trails, ATV use - on the Ward Legacy Trail only, and skiing and snowshoeing in winter. Peak visitation is from May to August. Entry fees (2019) are $7 per vehicle.